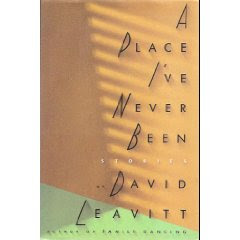 Although it took me longer than usual, I just finished reading the last few stories of David Leavitt’s novel A Place I’ve Never Been. Leavitt’s understanding of the human condition is very prevalent in this book of short stories, from dealing with strong romantic feelings that can never be in a friendship between a straight woman and a gay man, to the trials and tribulations of living in a non-traditional family. Many of the stories centre on a similar theme, and that is of loss. Loss of a loved one, loss of a pet, a lost loved that could never happen – and behind it all the deep loneliness we all feel at one time or another. Deciding to finish this novel at a time when I am feeling a little homesick has made me want to jump in my car right now and take the 600 kilometre trek back to hometown to reconnect with my own family.